Growing up in Central America and Mexico, young people face many challenges: inequality and violence, limited economic opportunities, a lack of basic government services, political instability, and the remnants of civil war. 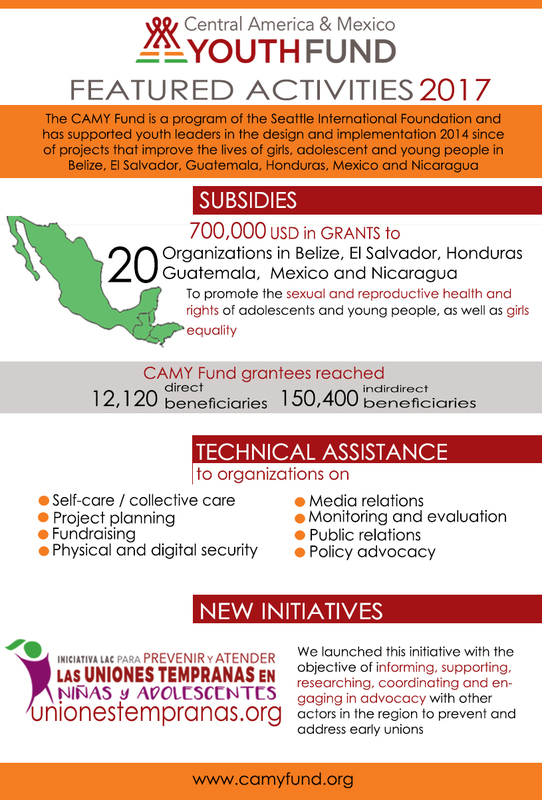 The CAMY Fund supports young leaders in designing and implementing projects that improve the lives of young people in Belize, El Salvador, Guatemala, Honduras, Mexico and Nicaragua. Managed by the Seattle International Foundation, the Central America & Mexico Youth Fund (CAMY Fund) is the only intermediary fund of its kind in the region. Specifically designed to support young people in raising their voices on issues that affect them by giving them funding and technical assistance. We also help young people see opportunities beyond the immediate scope of their projects by developing leadership skills and networking with other donors and young leaders. The CAMY Fund is poised to grow. Preliminary evaluation results and stories from the field indicate that this Fund is a smart way to invest in youth and social change. The operational framework for the Fund lends itself to addressing myriad social problems currently affecting youth in Central America and Mexico and the Fund anticipates broadening its geographical coverage, issue area, and number of grantees over the next several years.